Today is Friday and another weekend is right in front of us. Shopping spree, spending your hard earned money, yes? Then, perhaps a quick glance at our income is a good thing to do. First, a bit of jargon buster. Household income is a measure of the combined incomes of people sharing a particular household or place of residence. It includes every form of income - salaries and wages, retirement income, investment gains, biz income, etc. Mean and Median - the two terms used by statisticians to find an indicator of household income in certain geographic area. JPM uses mean or average. In Malaysia, household income normally refers to the combined income of husband and wife as this is the most common finding when census is carried out. 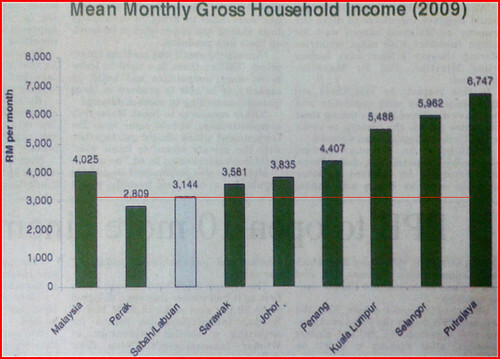 You can see from the histogram that Sabahans are among the lowest income earners, with average of RM3,144 per household. This means that each member of the contributing person earns about RM1,570. If Labuan is removed from the equation, I am quite sure Sabah would fall further down. Our friends in Putrajaya command higher income with average household bringing home double the amount of what we earn in Sabah. The United States are not really our neighbour geographically but economically they are considered by many as yardstick. So, heading for the shopping malls this weekend? Hahahaa...I might one of those.. I wonder what's the latest statistics of this. @Armstrong- our JPM is very prompt; the 2010 results will be out next year. 2011 ..your guess is as good as mine!